A Ford Lehman 135hp main engine drives a five blade propellor through a Velvet Drive gearbox. Aft cabin with walk-round double bed ( 1.9m x 1.40 reducing to 1.20 at the foot) headroom of 1.90. Flat floor throughout making for ease of movement and 1.9m of headroom plus 3 opening portholes. En suite toilet & shower room (and it really is a ROOM!!) all tiled and manual WC. Forward to starboard is a single bed cabin that also has a pull out writing desk to transform this cabin into a small office. Otherwise the bed is a single 1.8m x 0.8m. Up just 2 steps to the wheelhouse saloon. Comfortable seating to port, access door to starboard and another door aft to the raised aft deck. At the fore end a bar fridge to port and inside helm to starboard. Down two steps to a compact galley with marble worktops two burner electric hob and microwave oven (no gas on board) Note the electric oven is not included in the sale. Galley fridge. To port another shower ROOM and day heads as spacious as the aft cabin one. This heads & shower room also serves the double forward cabin with it's two singles berths (1.90m x 0.8 or 1.10m at head) or convertible to a large double and headroom of 1.85. The whole thing is heated by a Webasto HL32 diesel fired warm air central heating unit. Hot water is from a 40 litre tank heated by electric immersion heater and engine heat exchanger. On deck wide side decks permit ease of movement fore & aft. A good sized raised aft deck with full bimini. Outside helm, steps down to swim platform and davits. autopilot has never been used so will need checking. Old VHF never been used, to be checked and is not included in the sale for this reason. horn and search lights not functioning. Dutch steel cruiser for sale in France. 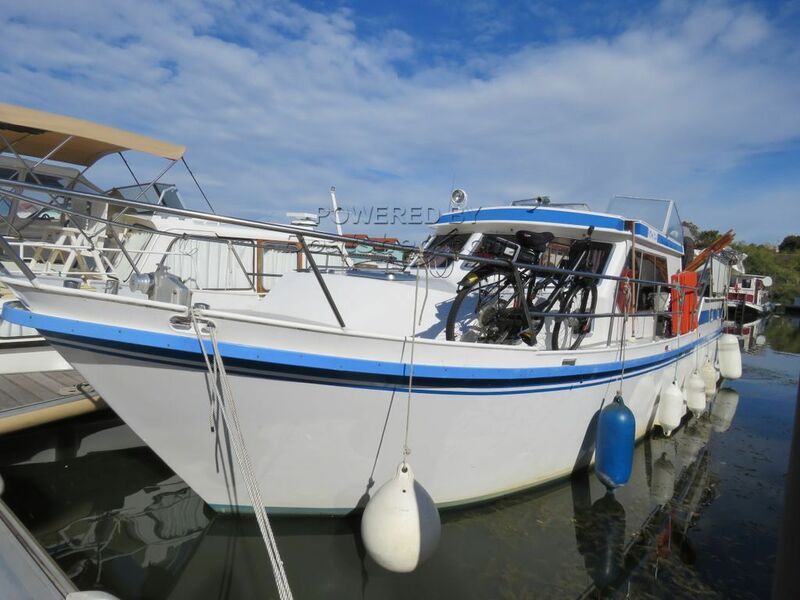 Boatshed Bourgogne is pleased to offer this Smelne 1200 motor cruiser for sale. Just three owners since 2000 and only for sale again for health reasons. Comfortable & practical cruising on French waterways & beyond. Now lying in a marina for winter and mooring paid until march 2019 and could be transferrable. Our vendor has detected some faults in the electric system (immersion heater non functioning on shore power, rudder indicator, water and diesel gauges ) and for that reason has accepted to list at this current asking price and will consider all offers. For more information and appointments to view, please contact Magali, your broker at Boatshed Bourgogne. This Dutch Motor Cruiser SMELNE 1200 has been personally photographed and viewed by Magali wharmby of Boatshed Bourgogne. Click here for contact details.